Nene Valley's talented teenage trio of Lottie Hemmings, Chelsie Bole and Leonie Hart. Nene Valley Harriers were on the run at Wormwood Scrubs last Saturday, with three teams taking part in the South of England Cross-Country Relays staged on the common close to the prison. The most arresting performance of the day came from the Under 15 girls who finished in a pleasing 19th place. Under 13 stars Evie Hemmings, Georgia O'Connell and Niamh Hodgson. All three athletes are in the bottom year of the age group and the club will be hoping that this proves to be their breakout season. The same squad finished as runners-up in the Under 13 section of the North Midlands Cross-Country League last season. Chelsie Bole ran the opening 2km leg in 7.55 coming home 16th. Lottie Hemmings carried on the good work, clocking 8.21 to take 18th position. The final leg was run by Leonie Hart whose time of 8.27 secured 19th place for the talented teenagers. The Under 13 girls also ran 2km each, and finished a highly creditable 26th. Evie Hemmings led the team off in her first Under 13 race for the club and ran strongly to finish 27th in 8.24. Georgia O’Connell completed the second leg in 9.33 with the club dropping one place to 28th and then Niamh Hodgson clocked 9.11 on the final stage. The Nene Valley senior men got off to a fine start courtesy of James McCrae, who came home seventh after a 14.46 clocking on his slightly under 5km leg. Mike Chapman took the second leg and his 17:02 saw the team slip to 22nd. Jay Belham was just 25 seconds slower than Chapman on the third leg, with veteran Paul Parkin clocking 19:48 for the last leg and bringing Nene Valley home in 30th place. Nene Valley endurance specialist Darryl Coulter finished 264th in the Abingdon Marathon on Sunday in a time of 3:17.28. The Oundle-based veteran has averaged a race of marathon distance or more every three weeks over the past year, and has plans to run plenty more. Jordan Foster of Nene Valley travelled to Portsmouth at the weekend to take part in the Great South Run. 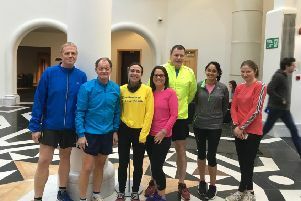 Foster made a name for herself when finishing as ‘first local lady’ in the Great eastern Run last weekend, and with a marathon to run in Switzerland in a week’s time decided to take it easy in Hampshire. The 27 year-old failed to stop her watch as she crossed the line at the end of the 10 mile circuit, but knew her time was in the region of 68 minutes which put her comfortably in the first 50 female finishers. Much to Fosters consternation, and with no explanation, the official results had her down with a finishing time of 1:25.14 and a position outside the top 1,000 ladies!